Before the news broke of the blockbuster trade being completed, Boston Celtics fans were already stunned their team was in talks to trade away beloved point guard Isaiah Thomas to Cleveland. Some may have been reluctant of the deal—which had Boston trading away Isaiah Thomas, Jae Crowder, Ante Zizic and a 2018 first-round pick in return for four-time All-Star Kyrie Irving—but Celtics general manager Danny Ainge worked for a superstar player without giving up major assets in Jaylen Brown and Jayson Tatum. Without question, Danny Ainge is looking to build a championship caliber team while still having enough young pieces for success down the road. Both Jaylen Brown and Jayson Tatum are two young players who will help with Ainge’s goals. Both 20-years-old or younger, the young duo will take the minutes of former Celtic Jae Crowder at the small forward slot. 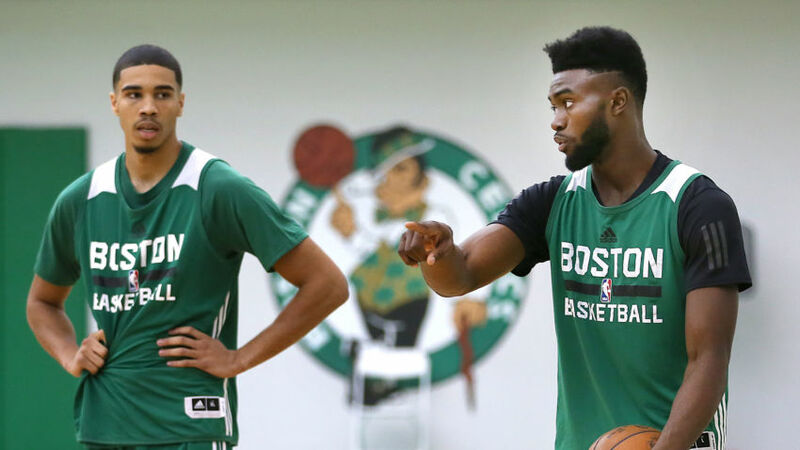 Though Gordon Hayward and Marcus Morris are the projected starters at the small forward and power forward positions, Brown and Tatum are expected to be two go-to weapons off the bench. Fresh off a successful rookie campaign where he averaged 6.6 points and 2.8 rebounds 17.2 minutes per game, Boston Celtics head coach Brad Stevens expects Jaylen Brown’s minutes to continuously increase as time goes on. His rookie numbers do not jump off the charts, but consistent production off the bench and big-time slam dunks surely did not go unnoticed. Taking on defensive duties against LeBron James in the 2017 Eastern Conference Finals, Brown proved he would not back down from anyone and defended the four-time MVP exceptionally well. Brown’s numbers do not fully prove how he helped Boston in 2016-17. In an interview on Chris Mannix’s podcast, Boston Celtics head coach Brad Stevens hopes Brown could become one of the league’s best defenders. To be paired with Brown is Boston Celtics No. 3 overall pick Jayson Tatum. The 19-year-old—out of Duke University—showed off his offensive prowess during his lone season as a Blue Devil, averaging 16.8 points and 7.3 rebounds per game while knocking down 45.2% of his shots. As proven in the 2017 NBA Summer League, Tatum has the ability to knock down the three-ball, utilize an impressive post fadeaway, as well as drive to the rim with ease. During the 2017 NBA Summer League event in Utah, Tatum averaged 18.7 points, 9.7 rebounds, 2.3 steals, and 2.0 assists in nearly 33 minutes of action. Meanwhile, out in the Las Vegas, Tatum provided similar results by averaging 17.7 points, 8.0 rebounds, 1.0 assists, and 0.8 blocks in nearly 32 minutes of action for the three games he was allowed to play there. Tatum is ready to earn some effective minutes as a rookie. Say Danny Ainge never pulled the trigger on acquiring Kyrie Irving; head coach Brad Stevens would have had great trouble balancing minutes between forwards Gordon Hayward, Jae Crowder, Jayson Tatum, and Jaylen Brown. Maybe Ainge gave up too much in the deal, but he was able to hold on to two players with imposing potential. Danny Ainge made Boston’s 2017 postseason run happen; over about a three year span, he built a championship caliber team from the ground up. Celtics fans must trust Ainge’s judgement once again and believe he made the right choice to bring them that closer to a championship. Latest Free Agent Buzz – Where Will Players End Up? Previous story Did JaVale McGee Sell The Larry O’Brien Trophy To A Pawnshop?